Picked up on this brilliant attempt by 7-Eleven to cash in the US Presidential Election on ‘Boy meets digital world’. 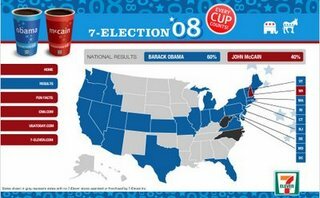 Coffee drinkers at 7-Elevens across America are casting their vote. Participants choose one of the two election coffee cups depending on their political preferences. The votes are being recorded and results of the favoured presidential candidate appear in USA Today as well as being tracked on the website. According to the site the 7-eleven voters have successfully predicted the result of the last two presidential elections.